Nearly a week into May and it still feels like March. I admit it, this is depressing. And looking ahead at the weather forecast, it doesn’t get any better. That big old ice cube in the lake is going to be with us for some time, so “cooler by the lake” is a reality for the long haul. Despite the drab skies and being surrounded by brown barren ground, this afternoon I set off to find Spring. Traveling up Seven Bridges Road, I diligently scanned the roadside and woods. Surely the further inland I traveled, the greater the likelihood of finding something green. Hoping that I might stumble across a micro climate to nurture growth and possibly even an early season blossom, I continued on. Optimistically. But it wasn’t to be found. 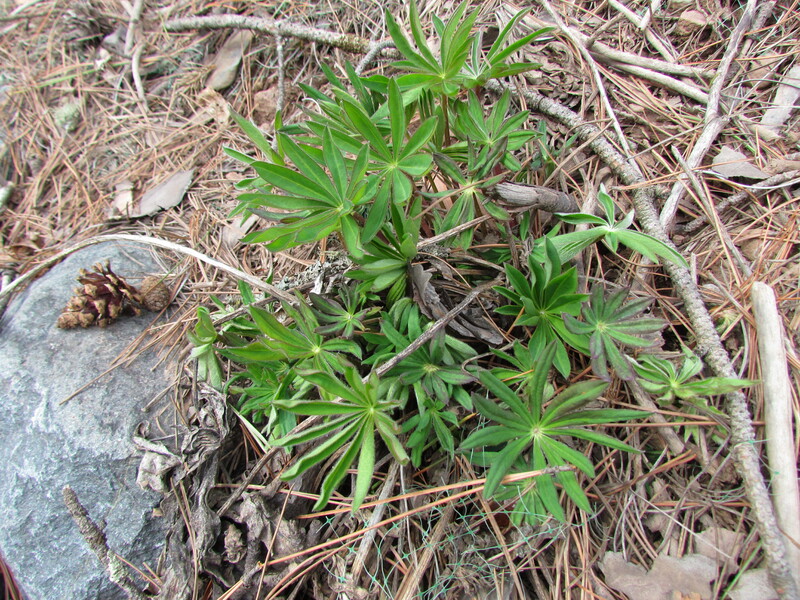 The best I could do was some early emerging wild lupine. Just seeing the young leaves was a hopeful sign. And the more I looked, the more clusters I saw coming up through the otherwise desolate ground. Realizing that I wasn’t going to find spring flowers, I tried to liberate my mind from its narrow mission. And the longer I walked the more I discovered other indicators. Just the fact that the road was snow-free was a good start. For a surface untouched by snow plows and trampled by snowmobiles and foot traffic, it took a lot longer to melt. So that was progress. Runners, dog walkers and cyclists were out taking advantage of this transformation. Surely that was a symptom of spring. 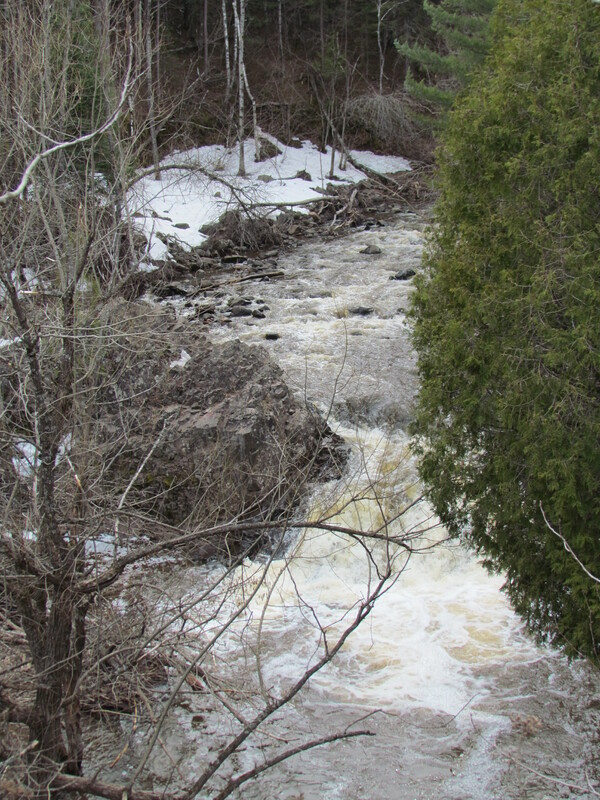 Amity Creek was awash in spring run-off, rushing down toward Lake Superior and creating white water wherever it coursed over rocks and fell over steep drops. I only had to ignore the snow still clinging to the shady riverbanks. Coming up on one of the road’s famous stone bridges, I spied a young couple snuggled up close and enjoying the view. Ah, spring lovebirds. Speaking of birds, there was a symphony of song in the woods, if one only stopped to listen. And come to think of it, I heard a flock of loons fly overhead this morning, easily identified by their distinctive plaintive cry. Spring migration at its finest. It’s slow in coming. But the signs are there. I still haven’t given up on finding those wildflowers in bloom. I just may have to venture further away from the lake to find them.